It’s anyone’s guess as to who will win in the 2018 Champions League Final between Real Madrid and Liverpool. Of course, we’re sure you have your favorites (as do we) so we won’t say who we’re rooting for. Regardless of which club you want to win, you’re going to be itching to watch the game. Considering Real Madrid is coming off of a 2-year winning streak for the Champions league, this is one match you won’t want to miss. And thankfully, you can watch the 2018 Champions League Final free online through a variety of sources. Coverage starts at 7 p.m. and kickoff is at 7:45 p.m. on Saturday, June 3 (GMT+1). In the UK, BT Sport will show the 2018 Champions League final both on TV and online through a free live stream, no subscription necessary. If you live outside the UK but still want access to the live streams, we recommend using a VPN to connect to a server in the UK. This will mask your true location and assign you a UK IP address. Once connected, you can bypass the geo block and watch as if you live in the UK. Once you have a VPN connection, you can utilize Kodi to watch the game live (more info below). Our top recommendation is IPVanish, a paid VPN service with a huge range of servers, including several locations in the UK. 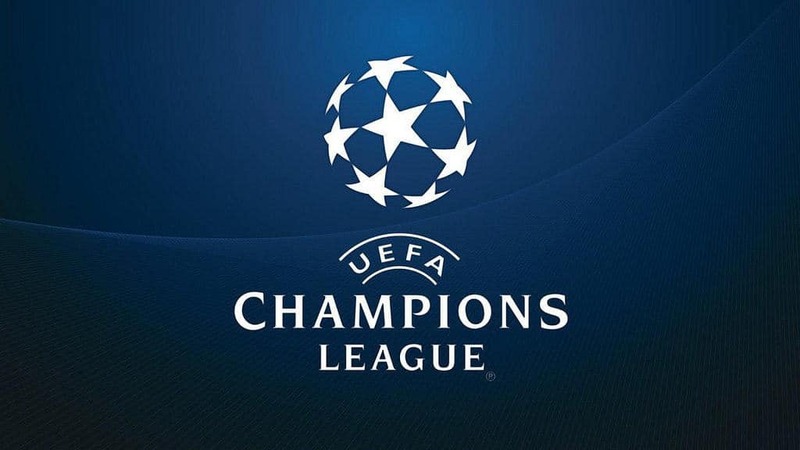 IPV offers the necessary bandwidth to live stream video in high definition, and a stable connection so you can watch the entire Champions League final uninterrupted. IPVanish offers apps for Windows, MacOS, iOS, and Android. It’s also got a simple, straightforward interface and direct download APK available, which makes it ideal for Kodi users. If you want to live stream the Champions League final on Kodi, you’re in luck. You won’t need any third-party add-ons; everything you need is located in the official Kodi add-on repository. You simply need to install the Youtube add-on and search for the BT Sport channel to access the stream. Select Install. When the add-on is ready, you’ll see a notification indicating the add-on is installed. 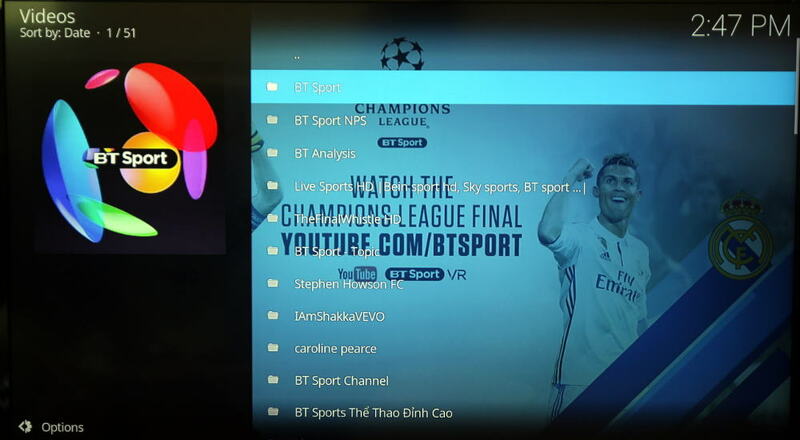 From here, you can use the search function to find the BT Sport channel and the Champions League live stream. Remember that Kodi users are subject to the same geographic restrictions as everyone else, which means you’ll need a VPN to change your IP address if you’re outside the UK. If your Kodi device supports your provider’s VPN app, then just install it and connect to a UK server before opening Kodi. If you have an Android-based device without Google Play, you can still sideload the VPN app. For example, you can learn how to install a VPN on Amazon Fire TV and Fire TV Stick in this tutorial. If your device doesn’t support VPN apps at all, you’ll need to set up the VPN on an upstream device, such as your home wifi router or a virtual router. Most modern laptops have wifi cards that support the creation of virtual wifi routers, which is just a wifi hotspot broadcast from the laptop. Just connect your laptop to a UK VPN server, and then your Kodi device to the laptop’s wifi signal. We’ve got instructions on how to set up a virtual router on PC and Mac. BT Sport and the BT Sport addon is the best source, but not the only one. The following TV networks have working Kodi addons that will also be providing free live streams of the 2018 Champions League Final between Real Madrid and Liverpool. ORF (Austrian network). Addon available in the official Kodi addon repo. Are you placing your bets on the game? Many people are! There’s a good chance those who love to gamble on games will be turning to websites like Betfair and Bet365 to cast their lots. If you’re looking to get in on the action, but you’re traveling abroad and in a country where betting sites are blocked, you do still have options. Several VPNs will work to bypass content blocking restrictions on betting sites so that you can still access your account. We recommend you check out our article on the Best VPNs for Betting Websites to learn which sites to use, and which VPNs work to unblock betting sites in 2018.